Mix, food processor, or high speed blender until they're a fine powder. 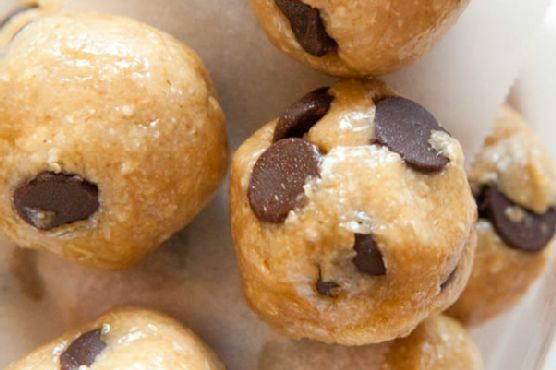 Don't overblend or you'll wind up with cashew butter very quickly. Add the agave, maple, vanilla and blend until incorporated. Be careful to just blend in short bursts and only until combined; don't over-process. Stir in the chocolate chips by hand. Form into balls and serve. If dough is sticky, chilling it in the refrigerator or flash-chilling it in the freezer helps make it easier to work with. Chocolate Chip Cookies works really well with Cream Sherry, Madeira, and Moscato d'Asti. A common wine pairing rule is to make sure your wine is sweeter than your food. Delicate desserts go well with Moscato d'Asti, nutty desserts with cream sherry, and caramel or chocolate desserts pair well with port.